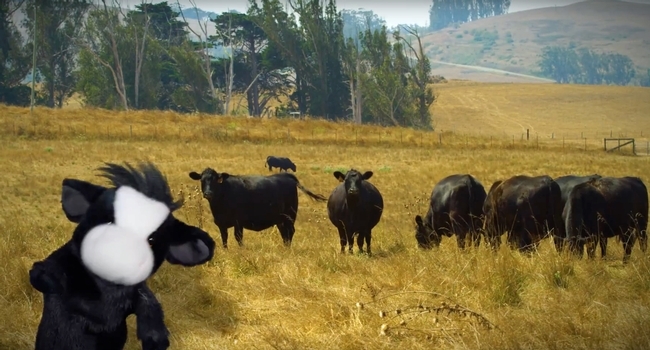 In a new series of videos, a cow puppet provides advice for hikers from UC Cooperative Extension on sharing open space with livestock. While Americans traditionally beat a path to the malls the day after Thanksgiving, many opt out of shopping on Black Friday to enjoy the outdoors. 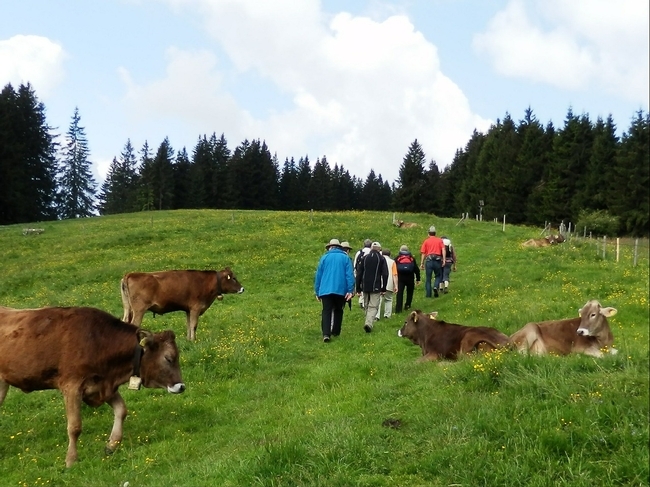 In regional parks and other open spaces, hikers may encounter crowds of a different sort – cattle grazing with their calves. A 1,200-pound cow blocking the path can be daunting. 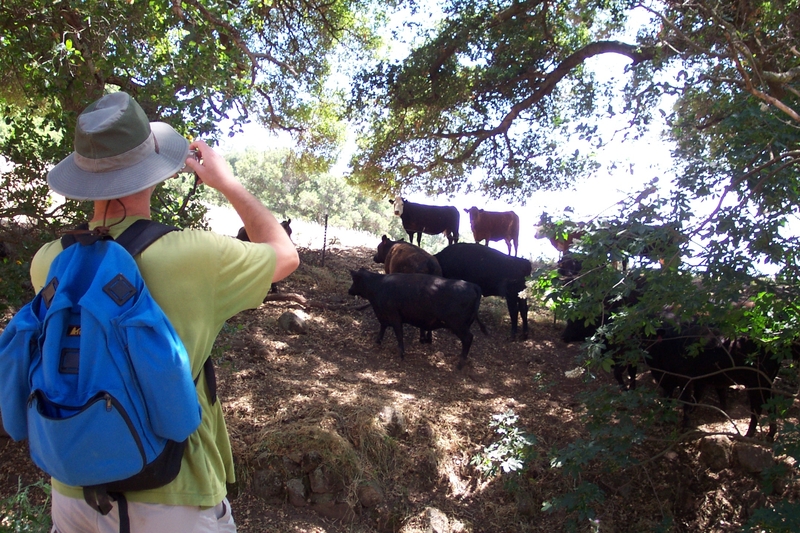 With a little patience and understanding, people who hike, bike and horseback ride can coexist peacefully with the cattle, according to Sheila Barry, UC Cooperative Extension livestock and natural resources advisor in Santa Clara County. For happier trails, UC Agriculture and Natural Resources has produced a series of videos that show hikers how they can amicably share open space with their beefy neighbors. In a two-minute video, a black cow puppet with a furry white face describes how to politely coax cows to moo-ove aside without spurring a Black Friday stampede. “We wanted to produce videos that are entertaining as well as informative,” Barry said. The cow pun-filled video also describes the ecosystem services cattle provide by consuming nearly their body weight in plants. By grazing, cows manage the vegetation, reducing wildfire fuel, increasing water capture and promoting the diversity of native grasses and wildflowers. Keep moo-ving and speak in a normal tone. Sudden movements and loud noises may surprise cows. Approach cows from the side or front. They find it udderly unnerving to have someone sneak up from behind, the bovine blind spot. Steer clear of getting between a protective mother and her calf. If you need to move a cow, step slowly into its flight zone. Invading the animal's “personal space” will motivate it to mosey aside. 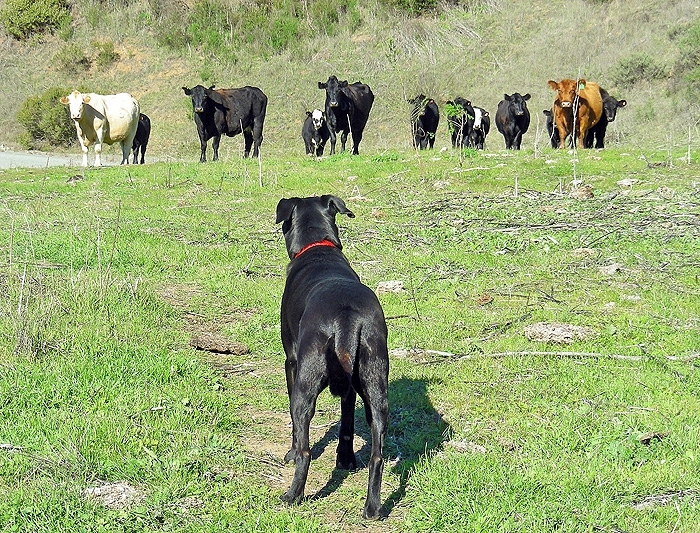 A second video, “Sharing open spaces with livestock when you have a dog,” gives advice for dog owners to keep their best friends safe around cows. In a third video, “A year in the life of a cow,” the UC Cooperative Extension spokespuppet describes a typical year for a beef cow. “The videos are a fun way to educate the public about grazing on rangelands,” said Stephanie Larson, UC Cooperative Extension livestock and rangeland advisor in Sonoma County. The videos are based on the UC ANR publication “Understanding Working Rangelands,” authored by Barry and Larson, at http://ucanr.edu/shareopenspace. Does social media reveal how we feel about cattle grazing? How do people really feel about cattle grazing on public lands? According to a study of comments on social media, park users don't feel as strongly as one might surmise from attending a public hearing about cattle grazing in parks. To get a more complete picture of public perceptions of cattle grazing, Sheila Barry, University of California Cooperative Extension advisor in the San Francisco Bay Area, analyzed photos and comments in the photo-sharing website Flickr. Her study, published in the February 2014 issue of Environmental Management, showed that Flickr can provide insight both through photos and comments into public perspectives on grazing in parks and open space lands. “These are just a first step toward broadening this understanding,” Barry wrote. “Further analysis of social media may provide managers with broader insights into public opinion compared to those afforded by traditional methods on a wide range of issues important to park and open space management.” Livestock grazing reduces the volume of plants that can fuel fire and improves wildlife habitat. But some public land managers, concerned about potential conflicts with park users, limit or ban grazing. In 2009, the city of Walnut Creek decided to end grazing in two city parks. A year later, neighbors who were concerned about weeds contributing to wildfire petitioned the city to resume cattle grazing. Assessments of public perceptions are often based on public hearings, which tend to attract special interests and favor negative input, or on surveys, which focus on a topic. The San Francisco Bay Area has over 133,000 acres of public land that is grazed by cattle and used by people to hike, ride bikes, walk dogs, ride horses and hang glide. Barry set out to explore how people voluntarily described their feelings about cattle grazing in the San Francisco Bay Area on social media. She examined photos and comments on Flickr. Using the search terms “cow,” “cows” and “grazing,” she found 1,087 photos of grazed regional parks in Alameda, Contra Costa or Santa Clara counties by 328 people with 956 comments. "Making peace with cows--they seem to be leaving us." Photo and comment by Flickr user Daniel Cooke. Although more research is needed to learn how to collect, analyze and interpret data from social media, Barry believes it could be a valuable source for informing decisions about public policy. Insight into public perceptions of cattle grazing will enable park managers to craft more effective education and interpretation messages about park use and management. “We are currently using insight from this project to develop education and interpretative information and panels for parks in the East Bay,” Barry said. Barry is publishing fact sheets for park managers and interpreters to share with park visitors. The fact sheets will address concerns she saw raised in the Flickr study such as how to safely and comfortably recreate in a park near grazing cattle and the benefits of cattle grazing in parks. She will also address public interest and questions revealed in the Flickr study with facts sheets titled “A Year in the Life” and “Bovines, Ovines, Caprines and Equines: What's the difference?” The fact sheets will also be available online and similar information will be posted in parks on interpretative panels. The article “Using Social Media to Discover Public Values, Interests, and Perceptions about Cattle Grazing on Park Lands” can be downloaded at http://link.springer.com/article/10.1007%2Fs00267-013-0216-4.